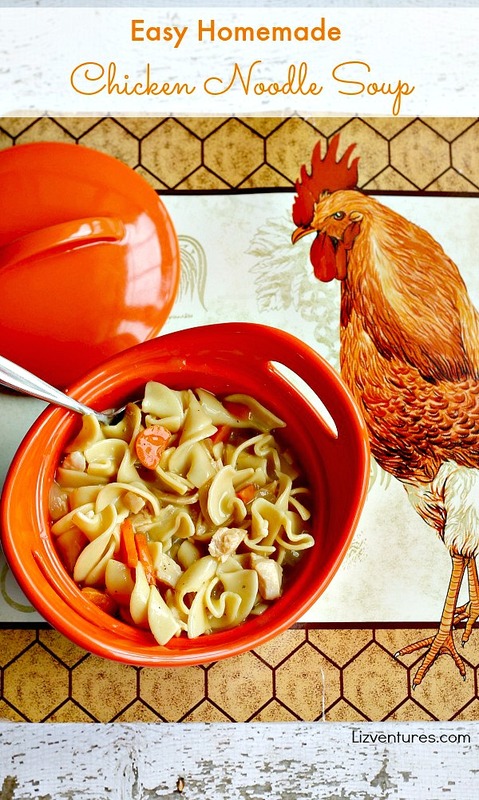 This easy homemade chicken noodle soup recipe was inspired by a chicken place mat. True statement. When I was visiting my son at Christmas, he showed me a set of chicken place mats he had found at the dollar store, and he asked me if I wanted one since they came in a package of two. Funny how the simplest things can touch my heart, but doggone it, that place mat meant the world to me because it came from my son, and I brought it home happily. 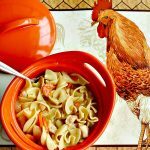 So when I was thinking of making soup one day, the chicken place mat came to mind, and this easy homemade chicken noodle soup recipe was born. In large saucepan bring water and bouillon to a boil. Cook celery, carrots and onion until tender. Add to water and bouillon. Add noodles. Cook uncovered until tender, about 10 minutes. Add cream of chicken soup and cooked chicken. Heat through. Naturally, I had to serve the soup on the chicken place mat too. To do otherwise? Well, that would be absurd. This looks so delicious! I would love to try this soon! Thanks for sharing your recipe! Thank you for sharing! So yummy and delicious! Love the soup served on the chicken placemat! Chicken noodle soup always reminds me of my childhood. My mom made huge pots of it. Thanks for sharing with See Ya in the Gumbo this week! Your Chicken Noodle Soup looks delicious! Happy St. Patrick’s Day and thanks so much for sharing with Full Plate Thursday! Thanks for sharing… Soup is so yummy! This is perfection! I love easy homemade soups, so hearty! I used to make noodle soup as well esp. during winter time to keep my housemates warm. Chicken noodle soup is one of my favorite things to make. I love this recipe and will use it! Given the rotten winter we just survived, this soup would be the perfect meal for a relaxing evening. I could eat some with veggies in it. That looks so hearty and delicious. Exactly what you need for a cold day. My family goes through chicken noodle soup like they go through socks. I will have to make this and see how it stacks up. Even though I don’t eat meat anymore, I look for recipes like this to makeover for my lifestyle. Thank you for sharing! I love chicken noodle soup but I have never made my own. This recipe looks and sounds delicious. This looks so good for cold days (what spring?!). Love the chicken placemat as well! I usually make mine with thinner noodles but this would be nice for a change. Due to the flu season being upon us, I know several people who could use a bowl of this Chicken Noodle Soup. This soup looks so delicious. Thanks for the recipe. That looks delicious and perfect for this time of year. Homemade chicken noodle soup is one of my favorite dishes to make my family. This past week the entire family had the flu so I made a big pot and we ate on it all week long. I love how much substance there is to this soup recipe! It looks delicious! You made me smile with that chicken on the table. This is one delicious-looking Chicken Noodles Soup! I think I’ll need a second bowl if this was served to me. This chicken soup looks delicious and easy enough to make! I am definitely going to give it a try. I love soup but I hate all the sodium in cans. Thanks for this recipe I’ll be trying it! Instead of the chix cubes I use the water from boiling real chicken & then I bread & fry the chix legs for hubby & I love soup ANY KIND of soup. I just like it a lot, but I’m going to try your recipe with my chicken broth I bet that’s going to be so easy! Thanks for sharing. Oh my goodness that looks just incredible! Perfect for a chilly day! This looks absolutely yummy. I like the fact that the ingredients are simple and often times ones we have right in our pantry. Your chicken placemat is very cute — make a very attractive presentation. This recipe looks real good and with all this good weather, I bet it hits the spot! That looks so yummy and great for cold days like today. Thanks for the recipe. 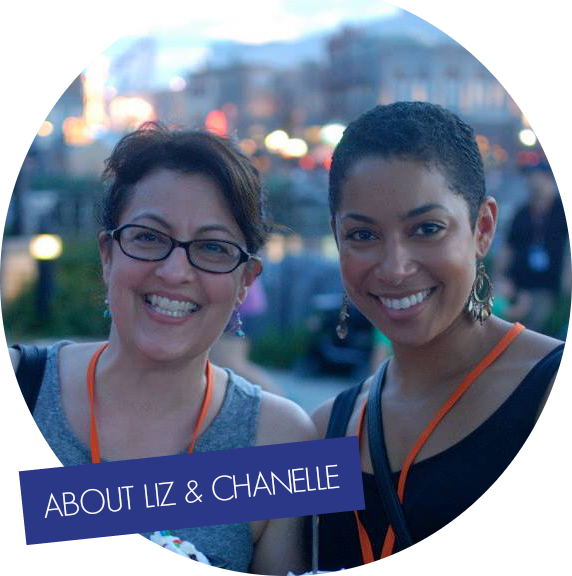 Liz, this sounds and looks amazing! I never thought to simply use cream of chicken as a base for a much heartier soup, brilliant idea!! Thanks for sharing! I love chicken noodle soup. This recipe is much easier than I cook it. I will try this one. We love a good Chicken Noodle Soup because it comforts the soul! Your version sounds so good right about now. That looks great & it looks easy enough to make. Thanks for sharing. Chicken soup is my husband’s favorite one & this one with noodles definitely looks pretty yummy. The recipe looks simple & easy to do as well. Will love to give a try sometime over the weekends. I love chicken soup-it’s my go-to when I’m feeling sick. Nothing like a good comfort food recipe to use during these freezing winter months. Oh my this looks so good. I love making soup for the family during the winter. I will have to get some noodles so I can do this. Thanks for the recipe. I’m not a big soup person but eat it like crazy when I’m sick! This would be perfect since this is such an easy recipe! I actually enjoy it when I’m sick and when I feel great. The flavors are just so good. I swear by Chicken Noodle Soup whenever I’m sick. I love the fact that this recipe is so easy to make. I haven’t made chicken soup in a very long time and this recipe sounds so good. It is perfect time of year here for homemade chicken soup. Thanks for sharing. Chicken noodle soup is great any time of year!!! i will have to make this! I don’t like chicken noodle soup (except one time my parents brought me some after I had the stomach bug), but I think I might try this! It looks good, easy to make, and cheap! Oh I got to add your chicken noodle soup recipe to my next week’s meal plan! Oh I just love homemade soup and this would be perfect for when you’re down but out. Mmm, this looks yummy! Thanks for sharing! I’ll have to give it a try. I normally don’t like chicken noodle soup, but maybe if I made my own homemade I would! oh wow that looks really really good. I love chicken noodle soup! going to have to try this! This looks so good! Looking outside at the snow, I could use some of this right now! Luckily the snow is all melted here. Still I could have used this on Thursday! a bowl of chicken noodle soup would be good for this cold weather. Warm and hearty chicken noodle soup is just what I need. It is not warming up at all here in Canada. awwwww….that’s a yummy comfort food right there. Thanks for sharing this recipe. I need to try it with all of this cold weather we are experiencing. Love the placemat, that’s awesome! I’d serve it on it, too. It almost looks like the chicken is checking it out. As he should, that soup would be such a great way to warm up. This looks like a hearty soup recipe to keep on hand when everyone is not feeling well! It looks amazingly good as well! This is a nice easy recipe for making chicken soup. And yes a good idea to serve it on a chicken placemat. This is perfect for cold weather!! Your chicken noodle soup looks very tasty and yummy. I love homemade chicken noodle soup!! This recipe sounds amazing!! I love chicken soup. I need to make it soon. I love a nice chicken noodle soup, there is nothing better for a really cold day! There is nothing better than homemade chicken soup. I am a soup snob, I really despise can soup after learning to make it myself. Your soup looks amazing!!! I love homemade soups especially during cold season! This looks so delicious! I recently made my own homemade chicken broth and soup as well. I guess it’s the season for some homemade comfort food. I haven’t made chicken soup before. But I think I should try your recipe. Your soup looks so good. I’ve actually been craving chicken noodle soup with as cold as it’s been lately. I love chicken noodle soup. This soup is just in time for the cold weather! This looks delicious and sounds great on this snowy day!!! Mmmmmm! I love that you used egg noodles in this recipe because I feel those are what make a chicken noodle soup truly great. I also prefer hearty soups like this one, especially when I need my comfort food fix. It has been so cold here today. I could definitely go for a nice hot bowl of Chicken Noodle Soup. There is nothing quite as good as Chicken Noodle Soup on a cold day. Yours sounds delicious. I have been thinking about trying to make Chicken Noodle Soup. You make it look simple! Yum! Chicken noodle soup is my favorite! I never thought to make it from scratch, but will have to keep your easy recipe handy!! This looks absolutely delicious! I’m definitely going to try it! That soup looks amazing! Winter is such a great time for soup and this recipe sounds delicious. When it gets cold and I am craving comfort food, a bowl of hot chicken noodle soup is exactly what I want. What I do not want is the it takes to make it! This looks easy as well as delicious. I am the same way. When it gets cold out hot soup is perfect. This soup looks really good. Nothing beat chicken noodle soup on a cold winter day. Chicken Soup can be a perfect dish for a kinds of things. My favorites are on a brrr could night. When my honey or grandchildren don’t feel good. Or, just because I am in the mood for it. It is great made all kinds of ways. Yours sounds really good. Have to make it this way now. I love your soup pic with the chicken! So cute. Great recipe. Chicken noodle soup always hits the spot! Your placemat is really cute, and I love the story behind it. Your soup looks good, too. I’m in the habit of making chicken stock fairly often, so I’m lucky enough that I could start with some of that from my freezer. I find that cooking pasta in the stock gives it a wonderful richness and flavor. I haven’t made Chicken Noodle Soup. This recipe does look easy. I doubt there is any soup better than chicken noodle. We have made it multiple times this week, I am going to try this one next…so spice it up a bit. Gotta love sick kids! This is great. A good comfy soup. Homemade is the way to go. Is this going to sound strange? But I have to tell you, the first (and only… so far) time I made soup of ANY kind was a few weeks ago. I cannot believe how easy it was lol. Soup is one of my favorite things to make. It’s so comforting. Nothing better than a nice chicken noodle soup, especially when you’re feeling sick! That’s a sweet story! I could definitely use a soup on a dreary, cold day like today. That’s a really cute story! I love the place mat and of course you had to serve the soup on it, there’s no other option! Your soup looks incredible btw. I am a big fan of easy recipes – and that soup looks delicious! If I had the stuff, I’d make it tonight! Oh this looks so tasty! Nothing beats homemade chicken noodle! Chicken noodle soup is one of my favorite meals. On a cold day like today, I need to try this recipe. This definitely came at a perfect time! The weather here is horrible and I have been craving for some good ol’ chicken soup. I’ll be giving this recipe a try. Thank you for sharing. that looks sooo good right now. Especially because I have the FLU!! Inspiration comes from the most interesting places! I can’t wait to try your soup, but I do need to find a chicken placemat to serve it on. This looks delicious. The picture makes me want some now with all this cold weather and snow around. Beautiful place mat. What a nice keepsake from your son. The chicken noodle soup is what we need in this weather! I had a whole chicken and was going to make chicken soup but never got around to it now I need to think about dinner… this looks so warm. There’s nothing like chicken noodle soup when you don’t feel well. The homemade kind is always the best. This soup looks really good. I want to try this with gluten free noodles. This looks delicious. This looks like the perfect soup for hunkering down at home. This is very similar to how we make ours, and it really is so tasty! I adore your chicken place mat! At first I thought the photo in the recipe card was promoting a new recipe book! What a great comfort food recipe. With so much sickness going around this is the perfect soup to warm our souls and help to heal us! I agree! There’s nothing to fight a cold like some homemade chicken noodle soup. Oh that looks delicious. I want to try making it at home. I love homemade chicken noodle soup!!! Also-your placemat looks adorable! I love home made chicken noodle soup. I have to laugh because my son was invited to have “homemade” chicken noodle soup at some people’s house and when he got there they served him Ramen noodles (the instant ones) he was so disappointed. So, he said when he gets home in 18 months he wants REAL home made chicken noodle soup! I was gonna make this yesterday but changed my mind. Now, I am so doing it since I am craving for it! Sounds delicious! I wish my hubby would eat soup, I find so many good recipes. I love homemade soup recipes, especially for chicken soup. And that placemat is pretty cute. Amazing what you can find at the Dollar Store if you just look. I find such treasures there! And you just can’t beat the price. This sounds easy to make. Thanks for sharing the recipe. I love chicken soup! That sure does look tasty. I’ll have to make some this week. Looks delish! I really could’ve used this a week ago when everyone in my household was sick! We love a good chicken soup here at our house. So good. This soup looks amazing. Major comfort food action, and such a simple recipe too! Sounds easy and it looks delicious! I love egg noodles too, they really add something and are so nice in soup. Thanks for the recipe! Love the place mat, and the soup looks delicious. Wish I’d had this recipe earlier in the week when the temps were below zero. I will save it for the next cold snap. I live in Rhode Island, so I totally need this right now. Chicken noodle soup is power food when it’s as abysmally cold as it is up here. I wish I saw this before my visit to the market last night! this looks great and doable. I am SO grateful that I can now make a recipe like this for taste rather than for just getting my core body temperature up. Yay for chicken soup, and yay for Florida! Your soup looks delicious! I would love some soup in this snowy weather. I love how you packed it with noodles! That’s always our favourite part of chicken noodle soup — the noodles :-). Looks delicious! Thanks so much for sharing this easy chicken soup recipe! I live in the Midwest, and you probably know how awful it’s been for the past few weeks. Recipes like this are great for the crappy weather we’ve been having. I need to make this in the worst way. It’s been so cold and miserable up here for the past month. This would really help take the chill off. Chicken Noddle soup is great to enjoy all the time. Always nice to find new recipes to try out. Oh it looks delicious and I love the placement. I haven’t ever made homemade chicken soup before, but someone made some for me one time and it was the best soup I have had. So I Might give this a try. I love when chicken noodle soup has the large noodles. I’ve never made it from scratch before, though. That looks delicious! I love how easy it is to make, too. Thanks! That looks delicious! We’ve been having rather unseasonably cold weather recently and I’ve been making a lot more soup than I usually do. So I’m really excited to have a new recipe to try. Thanks! That looks so good! I love home made chicken soup, especially when I’m sick. It’s magical. That looks so good and hearty. Love eating soups when it snowing and cold outside. I can’t even imagine someone not having chicken noodle soup. I’m sure you’ve had things that we haven’t though, here in the states. What’s your go to soup when your sick? I’ve been making chicken noodle soup from scratch a lot this winter and yours is an interesting variation on mine. That looks really good. I always make my chicken noodle soup in the oven but I think your method is even easier. I have been sick for a week so I need to ask my husband to make this for me! Anytime we are sick, I always make chicken noodle soup. It’s such a comfort food and so easy to make from scratch. I used to buy it canned but one day I took the plunge and decided to make some and I’ve been making it every since. Yum chicken noodle is my fave soup. I love ones with those big huge noodles. This looks delicious and perfect for cold gloomy days like today! 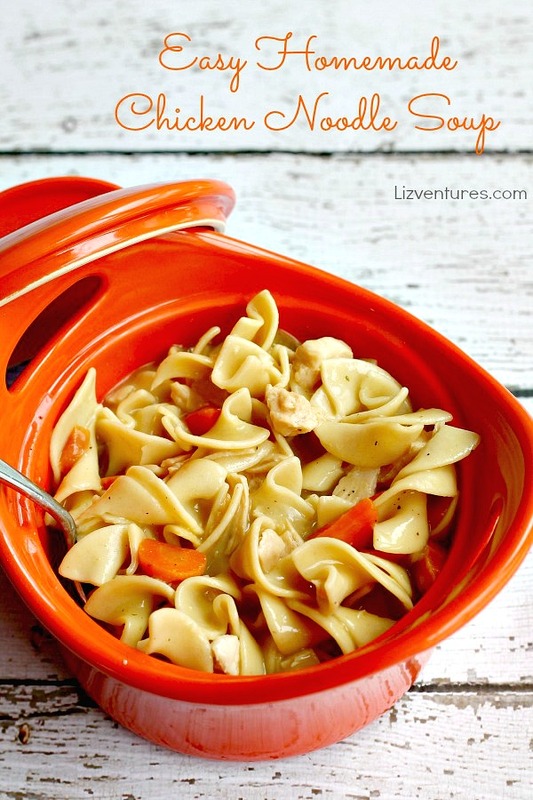 This looks delicious – chicken noodle soup is so much better homemade! Where did you get those adorable bowls? That soup looks delicious! There is nothing like homemade chicken noodle soup. Btw- your blog design, title – it’s awesome. I haven’t been here in a while (busy working at my son’s school.) I really appreciate you stopping by my blog. Thank you! That looks tasty. Great pictures! OMG Liz I want to dive into my computer and have a big bowl of that soup. It looks so good. I am definitely going to try this . I have all the ingredients on hand. Love the sentiments behind the chicken placemat. And that chicken noodle soup? It makes me want to never, ever eat chicken soup from a can. It looks like a bowl of deliciousness. My kids love chicken noodle soup. I might just follow your recipe today, thanks for the inspiration. I love chicken noodle soup when I am sick, but I Have never made my own before. I never realized it was so easy to make.